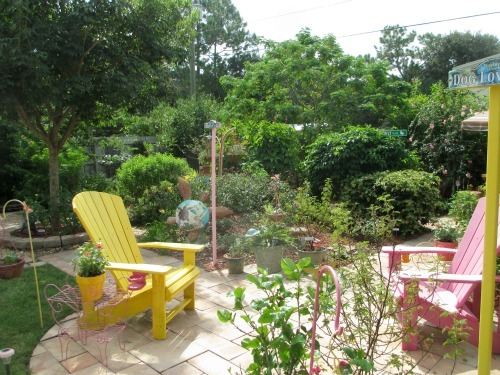 My friend, Judi, has created an absolute butterfly paradise in her backyard in Palm Bay, Florida, USA. 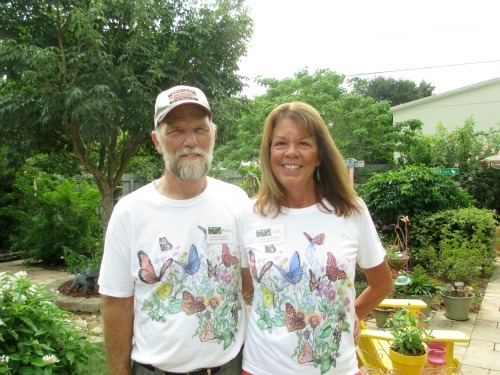 She started butterfly gardening in 2008 in just one small section. Today her whole yard has been converted to a butterfly habitat that attracts a wide variety of butterflies. Bright and lovely signs greet visitors. 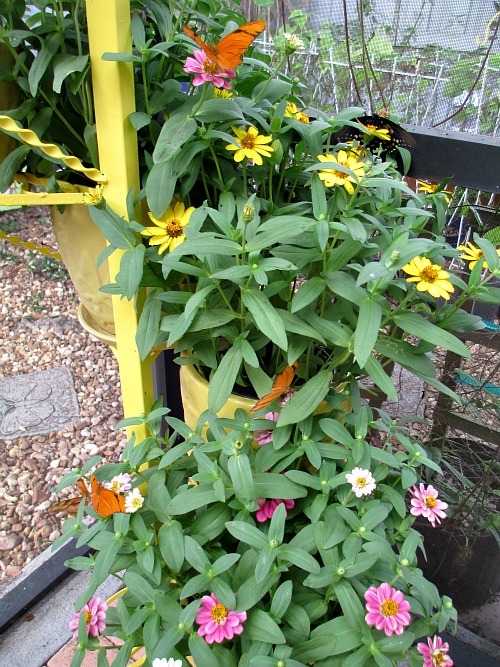 Click here to view a selection of delightful butterfly garden signs for your own yard. 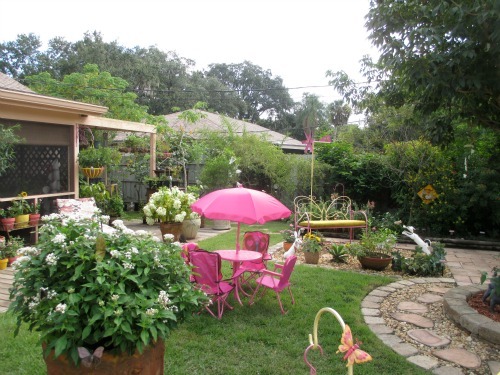 If you’re anywhere between Miami and Jacksonville, it would be well-worth your travel time to visit Judi’s Butterfly Garden and to experience first-hand what can be accomplished in your own private space. 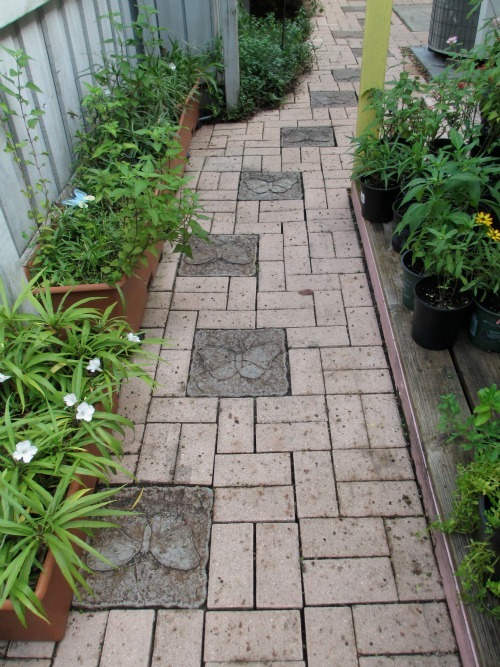 Butterfly stepping-stones on the walkway lead to the garden. She often has extra butterfly nectar- and host-plants available for purchase, including those shown on the right. 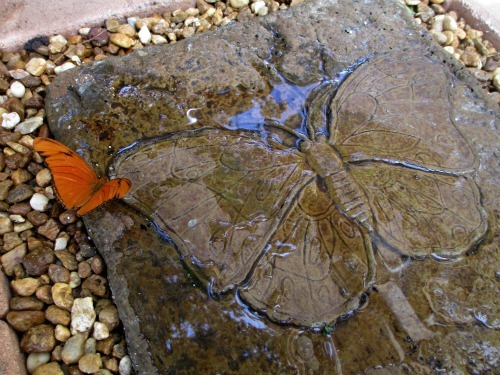 Click here to see whimsical butterfly stepping stones. 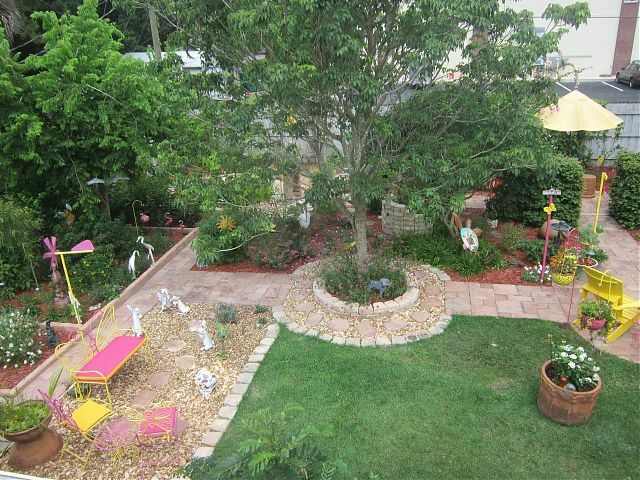 Judi’s backyard is furnished with stylish and functional butterfly-themed patio furniture. Click here to see a nice selection of available butterfly patio benches, chairs and tables. Zebra Longwings (Heliconius charithonia), Julias (Dryas iulia) and Gulf Fritillaries (Agraulis vanillae) are attracted to Passion Vines (Passiflora spp.) as both nectar- and host-plants. Judi has planted them throughout her garden to make it irresistible. 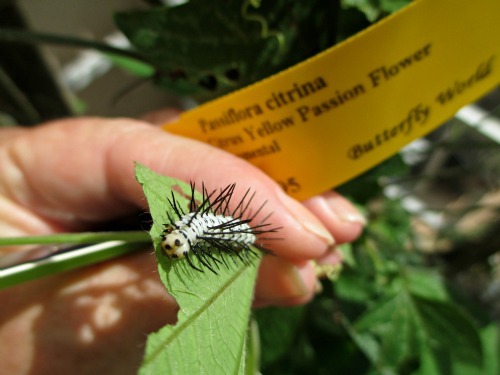 Zebra Longwing caterpillar eating a leaf of Citrus-Yellow Passion Flower (Passiflora citrina) which Judi purchased at world-famous Butterfly World in Coconut Creek, Florida. The Wild Lime (Zanthoxylum fagara) in the back left is covered with Giant Swallowtail (Papilio cresphontes) caterpillars. 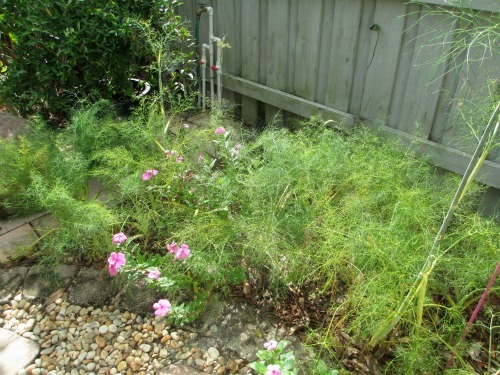 A patch of Fennel (Foeniculum vulgare) in the foreground feeds Eastern Black Swallowtail (Papilio polyxanthes) caterpillars. Monarchs (Danaus plexippus) find Tropical Milkweed (Asclepias curassavica) as well as native Swamp Milkweed (Asclepias incarnata). She has Dutchman’s Pipe (Aristolochia spp.) for the Polydamas Swallowtails (Battus polydamas) and Pipevine (Aristolochia spp.) for the Pipevine Swallowtails (Battus philenor). I even found a cute little Spicebush Swallowtail (Papilio troilus) caterpillar on her Spicebush (Lindera benzoin). 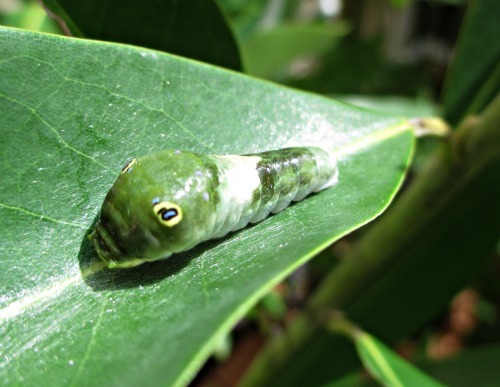 Spicebush Swallowtail caterpillar on a Spicebush leaf, its host-plant. Adirondack chairs invite passing a relaxing afternoon in the shade of the Hackberry Tree (Celtis spp. ), a host-plant for the Hackberry Emperor (Asterocampa celtis) butterfly. 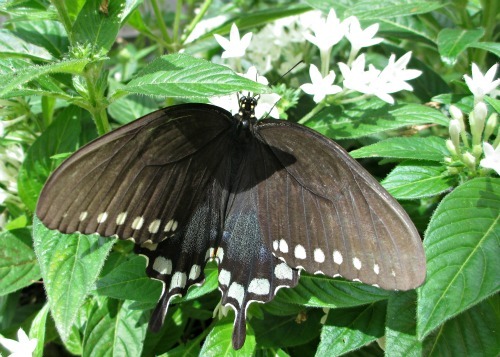 Spicebush Swallowtail butterfly on Penta (Pentas lanceolata). A variety of flowers such as Pentas, Porterweed (Stachytarpheta jamaicensis) and Firebush (Hamelia patens) provide nectar for all these attractive native butterflies. Even small pots of Zinnias (Zinnia spp.) invite the butterflies, such as these Julias. Butterfly enclosure for Judi’s private butterfly zoo. 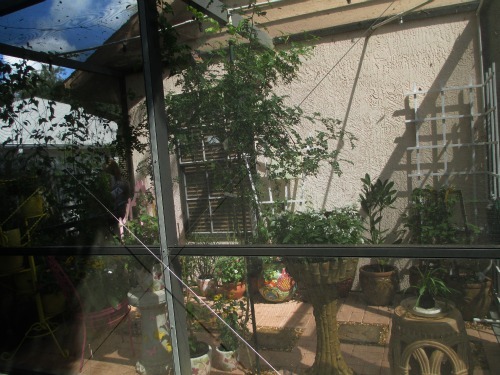 There is a screened-in enclosure where visitors can enjoy a close-up view of the butterflies nectaring on flowers, feeding on rotten fruit, and or puddling on the stone floor. 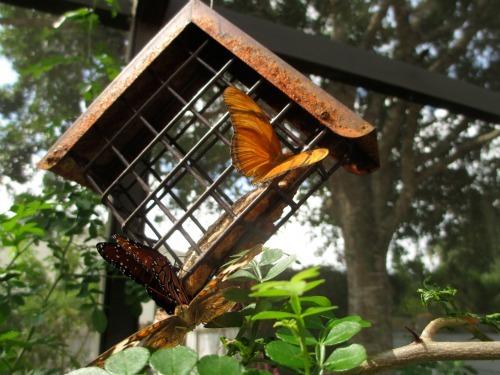 Queen (Danaus gilippus) butterfly, left, and a Julia butterfly, right, enjoying a rotten banana offered in a suet basket. Click here for various suet baskets for your own garden. Julia puddling on a wet stepping stone. 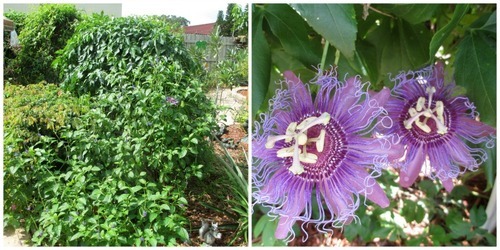 Check out her website where you can see more photos of her garden and find helpful information. Also visit and Like her Facebook page. Tagged Adirondack chair, Agraulis vanillae, Aristolochia spp., Asclepias curassavica, Asclepias incarnata, Asterocampa celtis, backyard, Battus philenor, Battus polydamas, butterfly enclosure, butterfly garden, butterfly stepping-stones, Butterfly World, Celtis spp., Citrus-Yellow Passion Flower, Coconut Creek, Danaus gilippus, Danaus plexippus, Dryas iulia, Dutchman's Pipe, Eastern Black Swallowtail, Fennel, Firebush, Florida, Foeniculum vulgare, Giant Swallowtail, Gulf Fritillary, Hackberry Emperor, Hackberry Tree, Hamelia patens, Heliconius charithonia, host plants, Jacksonville, Judi's Butterfly Garden, Julia, Lindera benzoin, Miami, Monarch, native plants, nectar plants, nectaring, Palm Bay, Papilio cresphontes, Papilio polyxenes, Papilio troilus, Passiflora citrina, Passiflora spp., Passion Vines, patio furniture, Penta, Penta lanceolata, Pipevine, Pipevine Swallowtail, Polydamas Swallowtail, Porterweed, private butterfly zoo, puddling, rotten fruit, Spicebush, Spicebush Swallowtail, Stachytarpheta jamaicensis, suet basket, Swamp Milkweed, Tropical Milkweed, Wild Lime, Zanthoxylum fagara, Zebra Longwing, Zinnia, Zinnia spp.